Carpet repair Tamworth. This common type of carpet damage caused by dog digging up the carpet in the doorway can easily be repaired by Carpet Doctor Tamworth. A professional carpet patch repair was completed to make an invisible repair. The pet pooch and the customer were very happy with the carpet repair service. 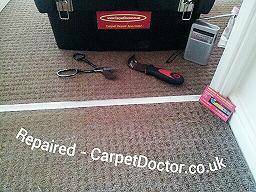 Seamless & invisible repair by Carpet Doctor in Tamworth. 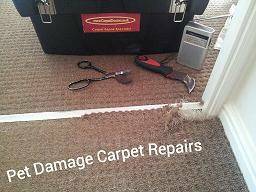 The carpet repair images below show un-speakable carpet damage caused by cats and dogs digging and wrecking carpets at home..
Another satisfied customer and another carpet repaired in minutes by Carpet Doctor in Tamworth. It's not rocket science, a professional carpet repair can prove to be cost effective with Carpet Doctor at your service repairing carpets in Tamworth to the highest of standards since 1997. Carpet Doctor is your local professional carpet repair and fitting service in Tamworth. Carpet Doctor has the perfect remedy for carpet damage caused by a cat or dog and can often repair the damaged carpet within 24 hours.. Contact us today for a speedy and efficient carpet repairing, carpet cleaning and carpet fitting service in Tamworth.